Plantronics Voyager 8200 UC Bluetooth wireless headset with BT600 Bluetooth adapter. 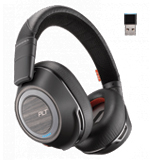 Plantronics Voyager 8200 allows you to cancel out most of the background noise and boost productivity. It delivers superior sound, seamless integration, industry-leading technology and multi-device connectivity. Plus, the only boomless, dual-paired microphone design on the market and two levels of active noise canceling help your employees stay focused and connected no matter where they work. Also compatible with Plantronics Manager Pro software support, you gain insight into every Plantronics headset being used company-wide, including device usage, event reporting and inventory analysis. * Plantronics Boomless microphone design features dual-paired (4 total) omni-directional microphones with advance noise canceling, optimizing your voice and minimizing noise caused by wind and background sounds. * Dual-mode active noise canceling (ANC) technology for the dual speakers (like the Bose Headphones). * OpenMic button lets you hear your surroundings when you need to. * Online indicator lights let others know when you are on a call. * Controls allow you to easily answer/end calls, control volume/mute and track forward/back for music playback. * Isolating stereo design provides immersive high-def sound, while powerful speakers deliver a high-quality music. * Smart sensors know when the headset is on or off, and calls can be easily answered simply by puttingon the headset. * Caller name announcement lets you know who is calling; no need to look at your mobile phone. * Dedicated mute button gives you quick mute access while voice alert announces mute on/off status. Dynamic mute alert notifies you when you try to talk when muted, for worry-free mute assurance.